Hope everyone is having a great day! I'm feeling much better and have been able to finally get a nice set of swatches done. :) So today, I have 3 of Jindie Nails' new colors to share. 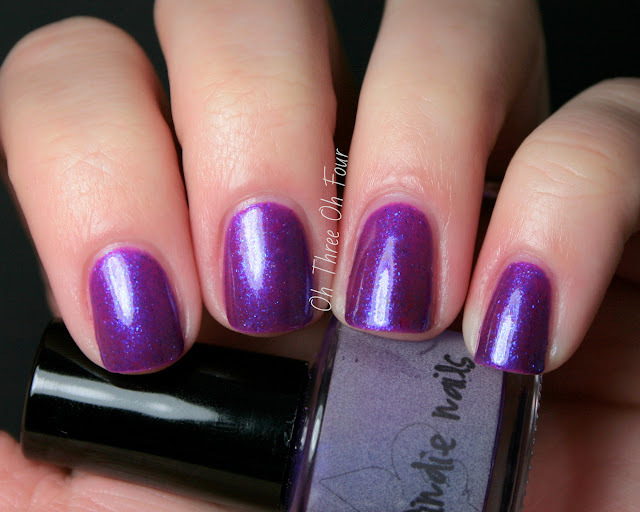 Electric Grape is a neon jelly with electric blue micro shimmer. All nails are 3 coats with a top coat of Seche Vite. I did have a small problem with there being some chunks of pigment in my bottle. Jenn, the creator of Jindie Nails, assured me it was a fluke and offered to replace without hesitation. :) Regardless, this color is very pretty and the blue shimmer helps it "glow" in normal lighting. Live Out Loud has a white "crelly" base with various shapes, sizes and colors of glitter including circle glitter. I used 3 coats with a top coat of Seche Vite. Yay for more circle glitter! :P Live Out Loud is a great mix of glitters and it reminds me of summer. ;) I didn't have to fish for any glitter and it dried quickly. Pretty Penny is described as having light pink and light gold round glitters, wine metallic, bronze metallic, classic gold plus gold shimmer and color shifting shimmer that shifts from pink to gold. All nails are 3 coats with a top coat of Seche Vite. Formula was of Pretty Penny was a little thick, I think that is due to being loaded with glitter though. Even though it was a little thick, it still dried quickly. The mixture of pink and gold reminds me a bit of Rainbow Honey's A Little Kindness and/or Sephora X Ice Princess, there are difference between them all just they have the similar idea. Some of you may notice that Jindie Nails' minis and full size bottles have changed shape. While I like the look of the minis, they can be tricky to use. I took a few photos to show you the brushes in comparison to other brands. You can click on the photos to enlarge them. Jindie Nails can be purchased through her Etsy shop here, which will be open tomorrow (January 11th) at 1 PM CST, and Mei Mei's Signatures here. Make sure to follow Jindie Nails on Facebook here and Instagram here for new colors and shop updates.